Well-known North American DXer Andrew Yoder has started a blog, with some of his observations of the pirate scene and other oddities from the other side of the pond. British land-based shortwave station WNKR hasn't been heard much on the air recently. But station operator Dave Martin has now uploaded onto YouTube the story of the station's early days from 1987-1994. 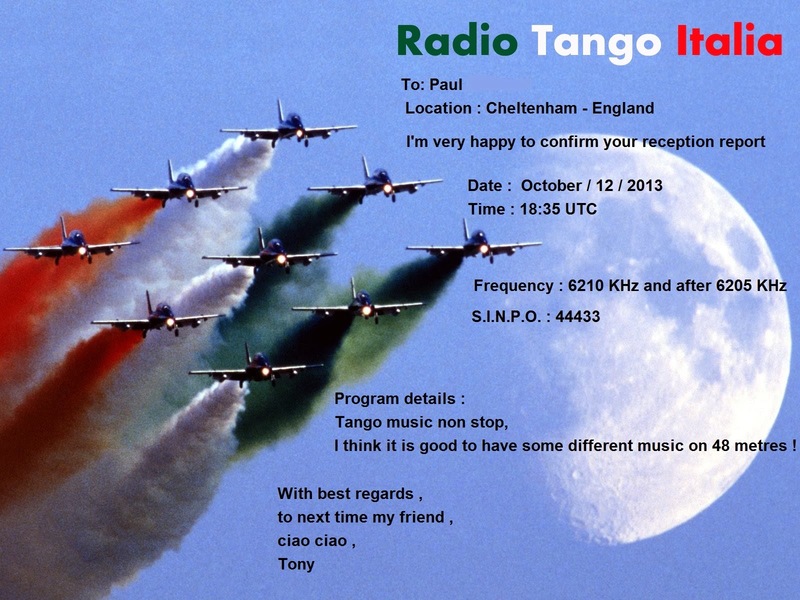 Nice QSL received from Radio Tango Italia. Many thanks. 4026 1805 Laser Hot Hits. Fleetwood Mac song. SINPO 44433. 6285 1657 Radio Ronex. "Dragon's Lair," ID. SINPO 34333. 6292 1706 Radio Experience. Bob Marley. SINPO 34333. 6324 1644 Radio Underground. Blue Oyster Cult "Don't Fear the Reaper," Afrika Bambaata. SINPO 54444. 3905 2040 Radio Alice. Country mx. SINPO 44333. 4026 1625 Laser Hot Hits. "Blue Guitar". SINPO 34333. 6205 2025 Radio Tango Italia. Tango mx, talk in Italian. SINPO 34333. 6240.5 0947 Radio Merlin Int. Mike Oldfield "Tubular Bells," testing ahead of tomorrow's Halloween special. SINPO 34333. 6245 1759 Radio Klabautermann. ID, greets, country mx. SINPO 43433. 6246 1530 Radio Underground. John Denver, ID, "then "Castles in the Sky." SINPO 54444. 6255 1700 Radio AC DC. "I Want You To Want Me," "Heart of Glass." SINPO 54444. On 6253 at 1735. SINPO 54444. 6266 1738 Radio Telstar. Sister Sledge "Lost in Music." SINPO 54444. 6285 0940 Radio Focus Int. Steve Miller Band "Keep on Rocking Me Baby," ID, contact details. SINPO 44433. 6305 1605 Radio Marabu. Bonnie Tyler "Total Eclipse of the Heart," ID jingle. SINPO 54444. 6310 1745 Radio Telstar South. RNI recordings from 1970s, splash 6305. SINPO 43433. 6325 1545 Radio Joey. Dutch song. SINPO 44433. 6390 1725 Radio Baken 16. "I Want You To Want Me," ID, greets, Kraftwerk "Radioactivity." SINPO 54444. 6425 1053 NMD Radio. Modulation test, polka, Dutch song, ID. SINPO 34333. 6747 0956 Radio Pioneer. Donna Summer "I Feel Love." SINPO 54444. 6796 1000 Radio Pink Panther. Terry Jacks "Seasons in the Sun," ID jingles. SINPO 54444. 6930 1515 Trans Europe Radio. Dutch band Bots "Seven Days Long." SINPO 54444. 6940 1553 Trans Europe Radio. QSO with Python. SINPO 54444. 6940 1556 Radio Python. Heaven 17 "Temptation," QSO TER. SINPO 54444. 6975 1705 Radio Ronalisa. "Rivers of Babylon," utility QRM. SINPO 33333. 7610L 2020 Over 60 Degree Radio. "I Only Want to Be With You." SINPO 34433. 7625 1550 Sluwe Vos Radio. "Crocketts Theme," short test, close down. SINPO 45433. 3905 1950 Skyline Radio Int. Desmond Dekker "The Israelites." SINPO 54444. 4026 2003 Laser Hot Hits. Foreigner "That Was Yesterday." SINPO 34333. 6205 2010 Radio Tango Italia. Tango mx. SINPO 44333. 6285 1929 Radio Focus Int. Mojos (from 1964) "Why Not Tonight." SINPO 54444. 6305 1915 Radio Marabu. Alternative mx, jingles. SINPO 54444. 6310 1920 Radio Telstar South. Moody Blues song, talk about the group, offshore pirates. SINPO 54444. 4026 2030 Laser Hot Hits. Fleetwood Mac "Seven Wonders," utility QRM on 4024. SINPO 43333. 6210 1655 Sluwe Vos Radio. Electro instrumental mx, ID jingles. SINPO 54444. 6245 1701 Radio Tina. Greetings, "Casanova" song. SINPO 44433. 6285 1725 Radio Altrex. Back on the air! ID, greetings, T Rex song. SINPO 34333. 4026 2045 Laser Hot Hit Hits. "Don't Worry," then Alphaville "Big in Japan." SINPO 44333. 4026 1917 Laser Hot Hits. Tony James px. The Imperials "Who's Gonna Love Me." SINPO 44433. 6747 1910 Radio Pioneer. Weak signal. SINPO 24332. 6910 1900 Premier Radio. "Shake Your Body Down", ID, email address, The Goodies theme tune. SINPO 44433. 4026 1905 Laser Hot Hits. Gary Drew px. "White Lines." Grandmaster & Melly Mel, then ads for FSN News and Offshore Echoes. SINPO 44333. At 12 noon, Radio Jackie celebrated 10 years as South West London's legal station. Jackie, is of course, really marking its 44th birthday, as it started life as a pirate in 1969 before being closed down in 1985. Lucy Mayer talks now to Programme Controller, and Jackie pioneer, Dave Owen, to see how the last ten years have shaped Jackie, from pirate to modern day radio station. 4026 1605 Laser Hot Hits. Modern Faith "Say A Little Prayer." SINPO 44433. 6210 1524 Skyline Radio Germany. Jingle IDs, music, fair peaks. SINPO 24332. 6210 1755 Radio Tango Italia. Tangoes. SINPO 34333. 6240 1518 Radio Casanova. Dutch songs, ID, occasional utility splash. SINPO 54444. 6267.5L 2045 Over 60 Degree Radio. Oldies. SINPO 24332. 6300 1532 Tower Radio. Dutch songs, utility splash. SINPO 53443. 6310 1735 Radio Telstar South. Wayne Fontana & The Mindbenders. SINPO 54444. 6326 1748 Tower Radio. Move from 6300, "I Don't Want ot Lose Your Love Tonight," ID jingle. SINPO 54444. 6423 1623 Radio Zeewolf. Dutch songs, greetings to Iann. SINPO 54444. 6423 1805 Radio Lowland. Giving out contact number, "Charlie Brown." SINPO 44433. 6747 0934 Radio Pioneer. Dutch folk songs. SINPO 54444. 6796 0903 Pink Panther Radio. Steve Miller Band "The Joker," then Abba. SINPO 54444. 6910 2035 Premier Radio. Luther Vandross "Never Too Much", ID, email address, Denise Williams "Let's Hear It for the Boy." SINPO 34333. 6950 0807 Radio Coax. IDs, email address, only running 2 watts. SINPO 24332. 9510 0817 Radio City v IRRS. Pilot "Magic", Chuck Berry "Riding in My Automobile." SINPO 55555. 4026 2033 Laser Hot Hits. The Doors "Light My Fire," Guns N Roses "Paradise City." SINPO 44333. 6199 1717 Radio AC DC. ID, splash from 6195. SINPO 53443. 6203 1718 Radio AC DC. Move from 6199, "Rawhide," rock mx. SINPO 54444. 6210 1615 Radio Tango Italia. Tango mx. SINPO 34333. 6240 1600 Radio Pelikaan. "Heat of the Moment", utility QRM. SINPO 43433. 6245 1606 Radio Pelikaan. Move from 6240, Dutch mx, ID, greets. SINPO 54444. 6245 1722 Radio Tina. Peter Sarstedt "Where Do You Go to." SINPO 44433. 6270L 1647 Over 60 Degree Radio. "Take Me Home." SINPO 24332. 6285 1620 Long Live Radio. Tuning signal, email address, instr mx. SINPO 34333. 6290 1726 Radio Mustang. Dr Hook "Sylvia's Mother." SINPO 54444. 6310 1637 Radio Telstar South. "Power to the People," ID, "Magic Moments." SINPO 54444. 4026 1942 Laser Hot Hits. Laser Goes DX. Old recording of EMR, featuring offshore memories of Atlantis. SINPO 54444. 6305 1935 Radio Merlin Int. Rod Stewart "Stay With Me," ID. SINPO 34333. 4026 1925 Laser Hot Hits. Gary Drew show, dedicating his programme to former Capital DJ Mike Allen, Grandmaster Flash "The Message." SINPO 44433. 3905 1745 Skyline Int Radio. Testing audio, ID, greets, UB40 "Lonely Girl." SINPO 54444. 3985 0831 Radio Atlantic 2000 via R700. Free "All Right Now," also on 6005/7310. SINPO 44433. 4026 1741 Laser Hot Hits. Mike Andrews px. Hall & Oates, then Blondie. SINPO 44433. 6005 0830 Radio Atlantic 2000 v R700. Free. Also 3985/7310. SINPO 55444. 6200 1038 Radio Orang Utan. All Saints, ID jingle, Tina Turner "Nutbush City Limits." SINPO 34333. 6205 1336 Radio Borderhunter. Talking about the weather, Eurythmics "Sweets Dreams." SINPO 54444. 6210 0857 Radio AC DC. Rod Stewart "Hot Legs," "Rawhide," ID, greets to OzDXer in Australia. SINPO 54444. 6210 1013 Radio Saturnus. Rock, ID, greets to Radio Tina. SINPO 44433. 6210 1736 Radio Tango Italia. Tango mx. SINPO 34333. 6245 1653 Radio Tina. Polka, ID, instr mx. SINPO 44333. 6250 0816 Technical Man. ID, phone nos, version of "I Can't Get No Satisfaction" (not the Stones). SINPO 44433. 6265 0821 Radio Pelicaan. Dutch yodelling mx, ID, talk Dutch. SINPO 34333. 6282 1658 Radio Borderhunter. ID, Eagles "Hotel California.," up to S9+40dB. SINPO 54444. 6282 1754 Radio Zeewolf. Report for Borderhunter. SINPO 54444. 6285 0853 Top Radio. Polka, jingle IDs. SINPO 44333. 6285 1019 Bogusman. Inspiral Carpets "Two Worlds Collide", giving out email & web address. SINPO 44433. 6298 Radio Telstar. "I Love Rock n Roll," ID, slight het. SINPO 53443. 6305 1725 Radio Paardenkracht. Madonna "Papa Don't Preach," ID, spelling out name, splash 6310. SINPO 43433. 6310 1730 Radio Telstar South. "Quartermaster Stores", The Beatles "Paperback Writer," squeezed by stations on 6305/6315. SINPO 53443. 6315 1710 Radio Telstar. Relay of Artem's latest World Music Show. SINPO 54444. 6423 0846 Radio Lowland. Audio testing, ID, Motors "Airport." SINPO 44433. 6425U 1757 Radio Python (tent). Relay of Artem's World Music show. SINPO 54444. 6485 1715 Premier Radio. "Man of Action," ID, "broadcasting from west coast of Ireland," CW QRM on 6483. SINPO 33333. 6540 1048 Free Radio Victoria. "Silence is Golden." SINPO 54444. 6796 1034 Radio Pink Panther. German pop. SINPO 54444. 6975 1701 Radio Ronalisa. Queen "I Want to Break Free." SINPO 34333. 7310 0827 Radio Atlantic 2000 v R700. "Love is a Battlefield," also 3985/6005. SINPO 55444. 9905L 1042 Baltic Sea Radio. Pop, good signal, sudden off 1043. Back on 1051. SINPO 45444. 1611 1955 Radio Barones. CCR "Have You Ever Seen The Rain," ID 2000, greetings. S9+30dB via Twente. SINPO 55555. 3905 1848 Radio Alice. "Going to New Orleans," Alice jingle. SINPO 54444. 3932 1841 MRF Radio. Jingle ID, Harry Chapin "WOLD." SINPO 34333. 4026 1653 Laser Hot Hits. Lighning Seeds "Pure." SINPO 44333. 6210 1818 Radio Tango Italia. Tango mx. Powering in tonight. SINPO 54444. 6216 0849 Radio King SW (tent). Sounds like new transmitter, mod good but signal quite weak. SINPO 24332. 6238 1916 Radio Black Arrow. Coldplay, QSO with Sluwe Vos. SINPO 54444. 6238 1919 Sluwe Vos Radio. QSO, rock, talk in Dutch/English. SINPO 54444. 6239 1618 Big Podcast Radio (via Dutch relay). "Great Balls of Fire," "Living on a Prayer," talk in Russian and English. SINPO 54444. 6250 1608 Radio Onda Caliente. Dance mx, ID. SINPO 34333. 6255 1837 Radio Technical Man. ID, greetings, Dutch song. SINPO 44433. 6285 0842 Radio Grutte Pier. Dr Hook "Sylvia's Mother." SINPO 34333. 6285 1640 Dokkum DX Radio. Greetings, ID, "Why Can't You Tell Me." SINPO 44433. 6300 0834 Radio Merlin Int. Happy Mondays "Step On," ID jingles, utility splash. SINPO 43433. 6305 1600 Radio Paardenkracht. "You're the One that I Want," "One for You." SINPO 54444. 6305 1828 Radio Python. ID, alternative mx. SINPO 54444. 6310 1908 Radio Telstar South. "Man of Action," RNI jingles. SINPO 54444. 6325 1914 Radio Norton. Dutch songs. SINPO 34333. 6796 0825 Radio Pink Panther. "DISCO" Ottawan, "Most Beautiful Girl" Charlie Rich. SINPO 54444. 21510 1555 Pirate Radio Boston (USA). ID, greetings, chat, "Halleuyah." SINPO 34333. Dublin's Pirate Days is a six part interview series commemorating the 25th anniversary of the introduction of the 1988 Wireless Telegraphy Act that closed many of the most famous pirate radio stations in Irish broadcasting history. 3905 2200 Skyline International Radio. "Hello Mary Lou," then off with no announcement. SINPO 54444. 4026 2215 Laser Hot Hits. "Don't Worry," then Alphaville "Big in Japan." SINPO 44333. 4026 2050 Laser Hot Hits. The Earls "Remember Then." SINPO 44333. 6210 1654 Radio Tango Italia. Tango mx. SINPO 34333. 4026 1920 Laser Hot Hits. Offshore recording of 1980s Caroline. SINPO 44433. 6210 1910 Radio Tango Italia. Tango mx. SINPO 34333. 4026 1955 Laser Hot Hits. Soft rock. SINPO 34333. 6210 1948 Radio Tango Italia. Tango mx. SINPO 34333. 13860 1935 Undercover Radio (USA). American-accented talk, ID, email address, "Born to be Wild." SINPO 34333. 6210 1810 Radio Tango Italia. Tango mx. SINPO 34333. 6285 0835 Radio Goudenster. Dutch songs, ID, said closing down. SINPO 34333. 6300 1747 Tower Radio. Dutch songs, strong QRM from utility. SINPO 53443. 6302 0830 Radio Digital. Instr mx, ID 0844 and off. SINPO 44433. 6310 1742 Radio Telstar South. Andy Williams songs, offshore memories. SINPO 54444. 6320 1735 Radio Andromeda. Greek music. SINPO 54444. 6324 1805 Radio Malibu. Polka. SINPO 44433. 6423 1802 Radio Lowland. Country mx. SINPO 44333. 6747 1755 Radio Pioneer. Dutch drinking songs. SINPO 54444. 6796 1800 Radio Pink Panther. Bad frequency, utility QRM on both sidebands. SINPO 42432. 4026 2020 Laser Hot Hits. Christine Aguilera "Let There Be Love," Shapeshifters "Count on Me." SINPO 44433. The SWLing Post blog notes more pirate activity than usual in the USA following the US government shutdown. 6206 1805 Radio Ronalisa. ID, instr mx. SINPO 24332. 6210 1810 Radio Tango Italia. Tango mx, occasional ute bursts. SINPO 33333. 6285 1755 Radio Mazda. Dutch songs, IDs. SINPO 54444. 6425 1815 Radio Zomerzon. Pink Floyd "Another Brick in the Wall." SINPO 34333. 6796 1800 Radio Pink Panther. Dutch pop. SINPO 34333.